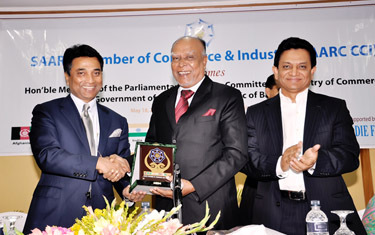 SAARC CCI organized exclusive meeting with a 7-member team of Bangladeshi Parliamentarians: The meeting was organized in collaboration with Federation of Bangladesh Chambers of Commerce & Industry (FBCCI) and Friedrich Naumann Stiftung (FNSt) on 18th May 2011. Mr. A.K. Azad, President FBCCI while extending welcome remarks identified issues being faced by South Asia today and called for greater role of the Private Sector to formulate policies in line with requirements of SAFTA and emphasized for adopting inward looking approach to increase level of economic cooperation among member states. 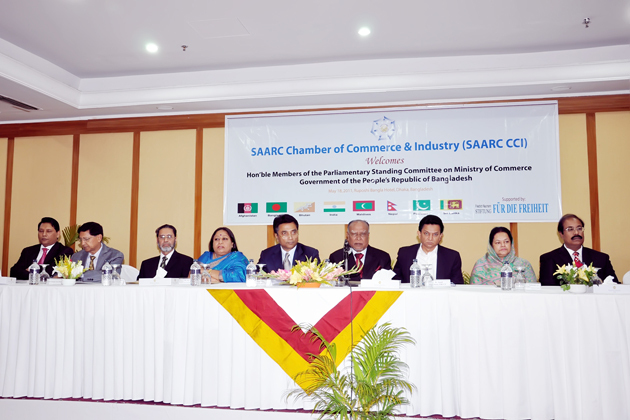 Mr. Annisul Huq, President, SAARC CCI gave a detailed presentation on SAARC CCI emphasizing that the institution had been actively involved in policy advocacy to the Governments of SAARC member nations on socio-economic issues. Mr. Iftikhar Ali Malik, Vice President SAARC CCI, while sharing his views said that SAARC CCI would soon commence the construction of SAARC CCI Headquarters Building at Islamabad and added that the Government of Pakistan had allocated a sizeable fund for this purpose and called for fiscal cooperation from other member nations of SAARC. Mr. Tariq Sayeed, while sharing his experience as the Immediate Past President SAARC CCI, said that with the changed global scenario, the institution had undergone changes and now its feedback on important issues was more comprehensive than in the past. He said that inclusion of services in SAFTA was the outcome of consistent demand of SAARC CCI and urged for inclusion of Investment in SAFTA. Mr. Pradeep Kumar Shrestha, Vice President, SAARC CCI (Nepal) enlightened the parliamentarians and participants about the 4th SAARC Business Leaders Conclave which has been for scheduled for 22nd-24th September, 2011 in Khatmandu, Nepal. Mr. Kosala Wickramanyake, Vice President, SAARC CCI (Sri Lanka) also shared his experience of 3rd SAARC Business Leaders Conclave which was held in Colombo, Sri Lanka in 2009. 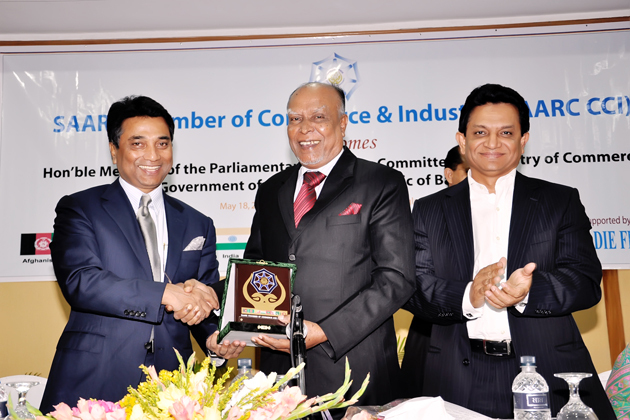 Hon’ ble Abul Kashem, Chairman Parliamentary Standing Committee for Commerce, Government of Bangladesh assured the management of SAARC CCI to extend all possible cooperation and applauded the role and functions of SAARC CCI under the leadership of President Annisul Huq. He was of the opinion that NTBs were the major hurdles in the intra-regional trade in SAARC, which under SAFTA rule of origin was only $ 1. 2 billion and urged for easing visa regime and removal of barriers to increase the current level of trade. Md. Ghulam Hussain, Commerce Secretary, Government of Bangladesh, said that the role of the Government and its officials were to facilitate the Private Sector and the Government had been taking keen interest to materialize agreements preferably with South Asian countries. Referring to Indian investment in Bangladesh for improving infrastructure, he was of the view that such cooperation amongst other member nations was also desired. The meeting was moderated by Mr. Iqbal Tabish, Secretary General SAARC CCI and was well attended by more than 100 participants including representatives of the diplomatic missions, government officials. Besides, private sector from the region also had strong representation. Deputy High Commissioner of Pakistan in Dhaka, Mr. Afzal Mehmood and Ambassador of Bhutan also attended the meeting.